DJI Phantom Aerial UAV (Unmanned Aerial Vehicle) is a quadcopter and comes with the inbuilt remote transmitter. It is designed with attractive features and high integrated design. It plays an important role in the field of filmmaking to shoot from the aerial view and useful for the radio control hobbyists and sports enthusiasts to record important events. The simple and compact design features make it easy to learn about an outdoor helicopter such as the DJI Phantom quadcopter. The product has the ready-to-fly design feature which makes the working simple with no complex tuning. With the lightweight design, the quadcopter is very compact and makes it favorable for carrying out its functions. The structure of the product follows the X-like layout, making the exterior more robust. The GoPro camera mounting case aids in attaching the camera in the quadcopter. The camera can be of any lightweight type, and be capable of being attached to it. For the upside down mounting position, the video rotation setting of the GoPro’s onboard is used. The GPS positioning makes the outdoor flight possible and compensates for the light wind. The fail-safe feature has made it possible for the DJI Phantom quadcopter to automatically land at the starting point even if the connection between the quadcopter and the transmitter is lost. The Internal Autopilot enables the quadcopter to return back home using the GPS without manual controls. The flight time is around 15 minutes and the product comes with a rechargeable battery. The Intelligent Orientation Control (IOC) helps in controlling the camera motions to make it fly front and back relative to a reference point without affecting the intention of the Phantom to go in a specific direction. The Naza-M autopilot facilitates this innovative feature and this is achieved using the USB cable included and the Naza Assistant Software which can be downloaded. This software allows the unlocking of more advanced features and flying modes, namely, manual control over maneuverability, more control over the transmitter, etc. But the basic mode is Attitude mode, so one has to expertise in this before using the flight controls of Naza-M. The transmitter of the DJI Phantom Aerial UAV is pre-tunable and acts as a remote transmitter. It establishes the connection between the quadcopter and the joysticks. The transmitter is controlled by IOC It can extend its signal and establish connection up to a distance of 980 feet, that is, about 300 meters. The radio transmitter has a range of 580 feet and this facilitates wide coverage to capture images. The product has the compatibility with the Zenmuse H3-2D Gimbal with the upgrade board which comes as an add-on with extra cost. This is useful for recording high stable and super videos. The horizontal speed of the quadcopter is around 22 miles/hour, that is, 10 meters/second which is fast enough to capture any fast-paced events or sports. The quadcopter requires 4 AA batteries along with the included rechargeable battery for its operation. The quadcopter is controlled using the joysticks. The physical joysticks provide more control over the quadcopter than the touchscreen sliders found in other company’s products. The motor of the Phantom is started by holding the left joystick to the lower right and right joystick to the lower left, with both joysticks pointing towards each other and down. After powering the motor, the joysticks are brought back to the center positions and by gentle powering up of motors leads to take-off the quadcopter. The motor can be made to stop by holding the left joystick to the bottom. The DJI ensures the maximum safety of the users and provides with prop guards that can be bought separately. The DJI’s Phantom Aerial UAV has been performing well in many ways. The setting up of the quadcopter is very easy and understandable even for those without any knowledge about the outdoor helicopter. The product is tested with Hero2, Hero3, and Hero3+, hence it can fit any of the GoPro Hero. This is an ideal product for the beginners with the easy and clear instructions of using the quadcopter. It is also favorable for the experienced users with various flight modes. The takeoff and the landing of the quadcopter are very stable. The responses to any of the control are very prompt and immediate. The GPS feature is with greater accuracy. 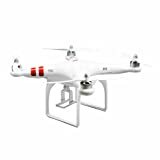 The Phantom quadcopter has been a finding place in many fields like search and rescue, farming, nature protection, etc other than filmmaking and sports. The DJI’s Phantom quadcopter with its unique and innovative features makes it favorable for people looking for UAV at an affordable price. What is the Best Quadcopter Under $100? Best Quadcopters / Drones With Camera Reviews - My Best Quadcopter With Camera Copyright © 2019.